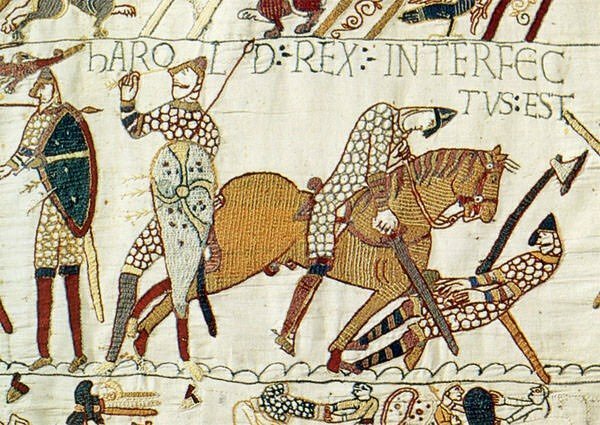 On the surface, the Battle of Hastings might appear to be just another conflict of many in the history of England to decide who would rule England. In a sense this is true. However, the final result was that, under William, more than under any previous ruler, there were political, cultural, and religious changes, among others, that proved to be dramatic and long-lasting, and evident in today’s England. Also, given the aforementioned history of England, the Battle of Hastings was inevitable. Because England was often at war with Viking invaders during the tenth century and off and on until about 1060, English monarchs ruled not only in England but simultaneously over Denmark, Norway, and Sweden as well, as will be seen in the reign of Canute. The events that led to the battle were set in motion long before the clash on 14 October 1066. One can perhaps go back to the first king of England, Ecgbehrt, in 829, but for purposes of discussion it is only necessary here to study the rulers of England and their reigns as precursors to war, beginning with Ethlered in 978. Also, there were many issues affecting the would-be rulers of England, particularly the fact that England was not free from Scandinavian influence, especially from Denmark. This theme replays itself over and over, until William conquered England, and united the country, whether it was by force or not. Those who analyze history would see, from reading the collective sources researched for this paper, that the Battle of Hastings was also inevitable from a Norman standpoint since their lineage can be traced back to the Vikings. John Schneider’s website notation that the Danes often used Norman ports as bases for their repeated forays into England sets the stage long before the actual Norman Conquest. Perhaps it was years of continental European influence that defined William’s invasion as anything different than another Viking attack. In any case, the Battle of Hastings set forth changes in England that are still evident today. Illustrating the England that existed under each of the kings studied here will show in part how the changes developed. Each king, of course, set to establish his own laws and doctrine that would imprint his identity on the kingdom or kingdoms he ruled. With each king, this study shows the turbulence that defined his reign, the conflicts and bloodshed that existed while each king sought to hold the throne, and the contributions each king made to his realm politically, religiously, socially, and culturally. Others who study English history see only repeated attempts to overthrow those in power, either by military force or blatant murder plots. There is even evidence of close relatives trying to usurp the thrones of these kings. However, even when these plots succeeded, changes that occurred still included some that benefited the common people. It is more to the point that the series of rulers, particularly William, studied here reflects the most significant changes in the history of the country. This paper, in examining the reigns of the Ethelred, Canute, Harold Harefoot and Hardicanute (short as their reigns were), and Edward the Confessor, will show how they came to power, the legacy each left – if any — and how the events during each reign ultimately led to the Battle of Hastings, with William the Conqueror’s victory changing England forever.